Posted on September 27, 2013	by Steven R. Cook, D.Min. The promise of the New Covenant was specifically with “the house of Israel and with the house of Judah” (Jer. 31:31). These were the same Israelites who had previously received the Mosaic Covenant, although they failed to keep it, with its external laws. The New Covenant would be radically different from the Mosaic Covenant, as God’s laws would be “within them”, even written “on their heart” (Jer. 31:33). God also revealed they will “all know Me, from the least of them to the greatest of them”, and then declared, “I will forgive their iniquity, and their sin I will remember no more” (Jer. 31:34). The prophet Ezekiel unveiled that God would give the Holy Spirit to indwell all His people as a blessing associated with the New Covenant (Ezek. 36:26-27; 37:14, 26-27). The Edenic Covenant (bilateral – Gen. 1:26-31; 2:16-17; cf. Hos. 6:7). The Adamic Covenant (unilateral – Gen. 3:16-19; cf. Hos. 6:7). The Noahic Covenant (unilateral – Gen. 6:18; 9:1-18). The Abrahamic Covenant (unilateral – Gen. 12:1-4; 13:14-17; 15:1-7; 17:1-11; cf. Gen. 26:2-5; 28:10-15; Ex. 2:24; 3:6-8; Josh. 1:2-6; 2 Ki. 13:23; 1 Chron. 16:15-22; Ps. 105:3-15; Neh. 9:5-10). Mosaic Covenant (bilateral – Exodus 19:5, 8; 20:1-31:18; Deut. 4:13; Gal. 3:16-19). The Palestinian/Land Covenant (unilateral – Deut. 29:1; 30:1-10). Davidic Covenant (unilateral – 2 Sam. 7:4-16; 1 Chron. 17:3-15). 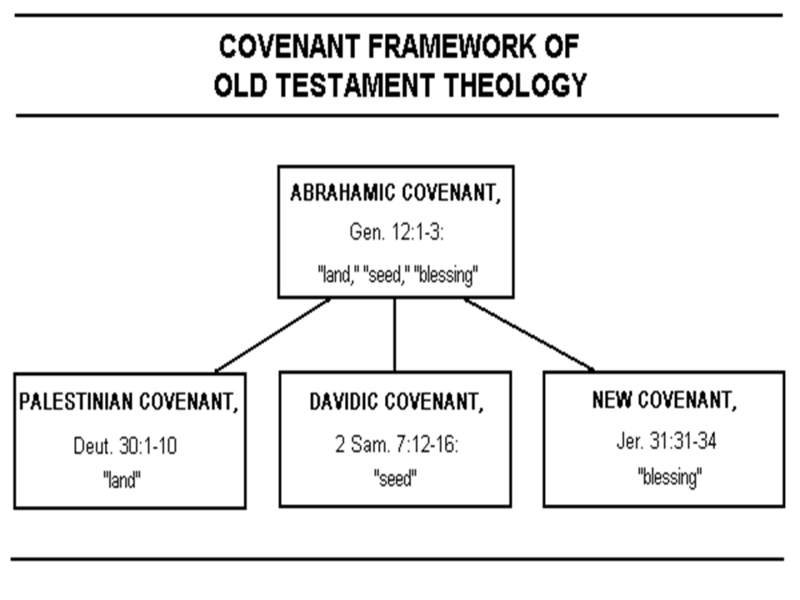 The New Covenant (unilateral – Jer. 31:31-34; 32:37-41; Ezek. 36:26-27; 37:21-28; Luke 22:20; 1 Cor. 11:25; 2 Cor. 3:6-7; Heb. 8:8-13; 9:15; 12:24). Some of the biblical covenants have signs. For example, the sign of the Noahic Covenant is the rainbow (Gen. 9:13, 14, 16; Ezek. 1:28; Rev. 4:3; 10:1), the sign of the Abrahamic Covenant is circumcision (Gen. 17:11; cf. Gal. 5:1-4), the sign of the Mosaic Covenant is the Sabbath (Ex. 31:12-17), and the sign of the New Covenant is the red wine/juice (Jer. 31:31-34; cf. Luke 22:20; 1 Cor. 11:25; 2 Cor. 3:6-7; Heb. 8:8-13; 9:15; 12:24). The Abrahamic Covenant is the greatest of the biblical covenants. It is a unilateral covenant in which God promised Abraham land, seed and blessing (Gen. 12:1-3). God gave the promise of blessing to Abraham when he was 75 years of age and nearly 25 years later ratified it with a covenant marked by blood (Gen. 15:17-18). God has not yet fulfilled all the promises given to Abraham. Though the Lord has given His promises and ratified them with a blood covenant (Gen. 12:1-3; 15:17-18), they will find their ultimate fulfillment during the millennial reign of Jesus Christ when He returns at His Second Coming after the Tribulation. From the Abrahamic Covenant comes the Palestinian Covenant (Deut. 31:1-10), the Davidic Covenant (2 Sam. 7:12-16), and the New Covenant (Jer. 31:31-34). These three are amplifications of the Abrahamic Covenant. Once God decided He was going to covenant with Abraham, then all the biblical covenants would be with Abraham’s physical descendants (Gen. 12:1-3; Rom. 9:4). The New Covenant is a difficult subject to understand and some of the finest theological minds have wrestled with it throughout their lives, occasionally reconsidering it. When one looks back into the Old Testament and reads about the New Covenant, it is clear from a plain reading of the text that the New Covenant was made exclusively with “the house of Israel and with the house of Judah” (Jer. 31:31). However, the New Covenant was inaugurated by Christ when He went to the cross and shed His blood, and the Christian benefits right now from some of the blessings of the New Covenant—such as forgiveness of sins and the indwelling of the Holy Spirit—because of his union with Christ (Jer. 31:31-34; Ezek. 36:26-27; 37:26-27; 1 Cor. 3:6; 6:19; Eph. 1:7, 13; 2:11-13). Because Jesus is a biological descendant of Abraham (and in the covenant community), then all who live in the Church Age partake of the spiritual benefits of the Abrahamic and New Covenant by virtue of their positional union with Jesus Christ (Gal. 3:7-9; 26-28; Eph. 2:11-13). The New Covenant is clearly made with the house of Israel and the house of Judah (Jer. 31:31). It was future when Jeremiah wrote (Jer. 31:31a)…Israel as a nation has not as yet received the benefits of the New Covenant, but will at the Lord’s Second Advent. In the meantime, true believers do share some of the blessings of the covenant. The fact that the church is related to the New Covenant is seen in the Lord’s Supper, where the cup represents the covenant and the blood by which it was ratified (Luke 22:20; 1 Cor. 11:25). Also Paul spoke of himself and the other apostles as ministers of a New Covenant (2 Cor. 3:6). When a search is made in the Scripture of Truth, the general declarations of the above passages are borne out by the details, for the Divine record shows that all the major covenants have been made with the nation Israel or with individuals of that race for the benefit of the nation. Every one of the thirty-three places where the word covenant (διαθήκη) is used in the New Testament, there is a reference to and a discussion of the covenant relationships existing between Israel and God as set forth in the Old Testament Scriptures. This declaration is made with the understanding that the New Covenant was first of all given to Israel, Jeremiah 31:31–40, etc., and that the believer of the present age enters into the blessings of that covenant because he is united to Christ who is the mediator of the New Covenant. (cf. Matthew 26:28; Mark 14:24; Luke 22:20; 1 Corinthians 11:25; and 2 Corinthians 3:6). The New Covenant is similar to a last will and testament. When Jesus died, the provisions of His will went into effect. Immediately all people began to profit from His death. For example, the forgiveness of sins and the possession of the Holy Spirit become the inheritance of everyone who trusts in Him, Jew and Gentile alike. However those provisions of Jesus’ “will” having to do with Israel as His particular focus of blessing will not take effect until the nation turns to Him in repentance at His second coming. Thus the church partakes in the benefits of the New Covenant even though God made it with Israel particularly. How is the church related to the New Covenant? Is the New Covenant being fulfilled in the church today? Ultimately the New Covenant will find its complete fulfillment during the Millennium when Israel is restored to her God. The New Covenant was made with Israel (Jer. 31:31, 33) just as the Mosaic Covenant had been (v. 32). One key element of the New Covenant is the preservation of Israel as a nation (vv. 35-37). However, though the ultimate fulfillment of this covenant awaits the millennial reign of Christ, the church today is participating in some of the benefits of that covenant. The covenant was inaugurated at Christ’s death (Matt. 26:27-28; Luke 22:20), and the church, by her union with Christ, is sharing in many of the spiritual blessings promised to Israel (cf. Rom. 11:11-27; Eph. 2:11-22) including the New Covenant (2 Cor. 3:6; Heb. 8:6-13; 9:15; 12:22-24). But though the church’s participation in the New Covenant is real, it is not the ultimate fulfillment of God’s promise. The fact that believers today enjoy the spiritual blessings of the New Covenant (forgiveness of sins and the indwelling Holy Spirit) does not mean that spiritual and physical blessings will not be realized by Israel. That still awaits the day when Israel will acknowledge her sin and turn to the Messiah for forgiveness (Zech. 12:10-13:1). The relationship of the Church to the New Covenant is the same as the Church’s relationship to the Abrahamic, the Palestinian, and the Davidic covenants. The physical promises of the Abrahamic Covenant, as amplified by the Palestinian and Davidic covenants, were promised exclusively to Israel. However, the blessing aspect amplified by the New Covenant was to include the Gentiles. The Church is enjoying the spiritual blessings of these covenants, not the material and physical benefits. The physical promises still belong to Israel and will be fulfilled exclusively with Israel, especially those involving the land. However, all spiritual benefits are now being shared by the Church. This is the Church’s relationship to these four unconditional covenants between God and Israel. The blood of the Messiah is the basis of salvation in the New Covenant and this was shed at the cross. The blood of the Messiah ratified, signed, and sealed the New Covenant (Heb. 8:1–10:18). The provisions of the New Covenant cannot be fulfilled in, by, or through the Church, but have to be fulfilled in, by, and through Israel. It is true that the Covenant is not now being fulfilled with Israel, but this does not mean it is therefore being fulfilled with the Church. Again, not all provisions go immediately into effect. The Church is related to the New Covenant only insofar as receiving the spiritual benefits of the Covenant (salvation benefit), but the Church is not fulfilling it. The Church has become a partaker of Jewish spiritual blessings, but the Church is not a taker-over of the Jewish covenants. The Church partakes of the spiritual blessings and promises, but not the material or physical promises or blessings. In summary, the Christian benefits from some aspects of the New Covenant, namely the forgiveness of sins and the indwelling of the Holy Spirit. The Christian is able to benefit from aspects of the New Covenant that are in effect right now because of his union with the Lord Jesus Christ who inaugurated the covenant with His shed blood on the cross. Listen to Audio Message – New Covenant – Lord’s Supper. Francis Brown, Samuel Rolles Driver and Charles Augustus Briggs, The New Brown-Driver-Briggs-Gesenius Hebrew-English Lexicon (Peabody, Mass. : Hendrickson Publishers, 1979), 136. Walter Bauer, A Greek-English Lexicon of the New Testament and Other Early Christian Literature, rev. and ed. Frederick W. Danker, 3rd ed. (Chicago: University of Chicago Press, 2000), 228. William MacDonald, Believer’s Bible Commentary: Old and New Testaments, ed. Arthur Farstad (Nashville: Thomas Nelson, 1995), Ge 6:8–22. Charles Fred Lincoln, “The Biblical Covenants” Bibliotheca Sacra, 100 (1943): 316-317. Tom Constable, Tom Constable’s Expository Notes on the Bible (Galaxie Software, 2003), Mt 26:28. Arnold G. Fruchtenbaum, Israelology: The Missing Link in Systematic Theology, Rev. ed. (Tustin, CA: Ariel Ministries, 1994), 635-36. This entry was posted in Christian Theology, Church, Dispensationalism, Hot Topics and tagged Abrahamic Covenant, Biblical Covenants, Bread and Wine, Last Supper, Lord's Supper, mosaic covenant, New Covenant, The Blood of Christ, The Lord's Supper, The New Covenant. Bookmark the permalink.